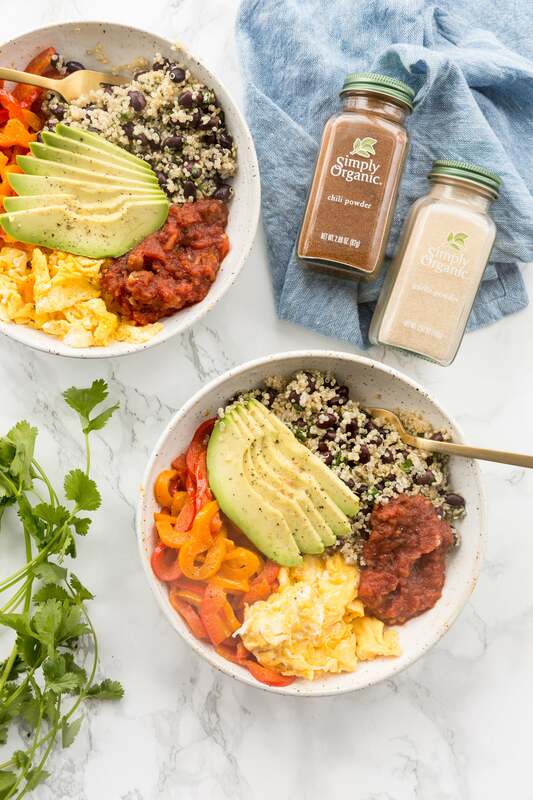 This fiesta inspired breakfast bowl has many of the fixings of a Mexican party – avocado, beans, cilantro, salsa, chili powder, and plenty of zesty lime! Served with spiralized bell peppers seasoned with Simply Organic‘s garlic powder and chili powder, it’s colorful, nutritious, and flavorful! Everyone loves a big, filling, and tasty breakfast! After all, breakfast is the most important meal of the day. Unfortunately, most of us default to something easy, portable, and quick during the weeks! But alas, that’s what the weekends are for – spending more time on breakfast, right? Yes! 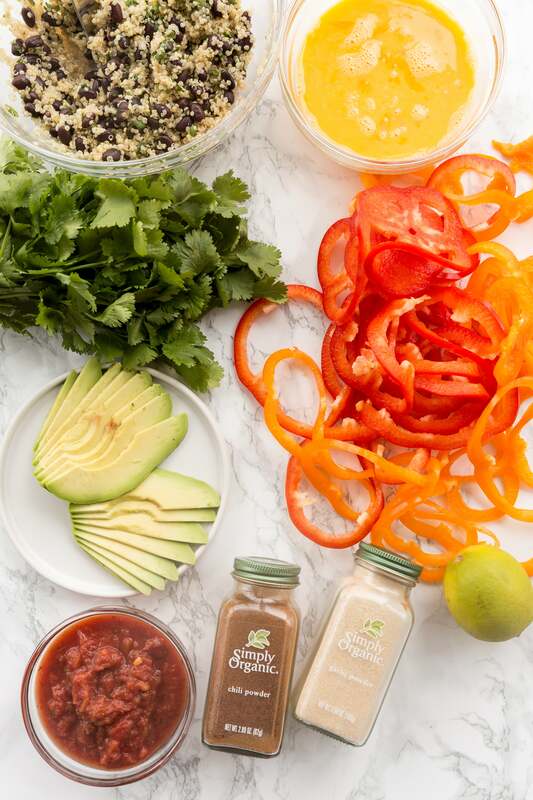 These fiesta breakfast bowls are full of some of the ingredients you’d find in a burrito bowl – salsa (you could swap in a fresh pico de gallo here! ), avocado (or use guacamole! ), black beans, cilantro, lime, and traditional spices used in Mexican cooking, like garlic and chili. Specifically, we’re using Simply Organic‘s line of spices to season the bell peppers very simply (pun intended!) with garlic powder and chili powder. Honestly, these are two of my favorite spices to use when seasoning foods – they add a great depth of flavor and are universally enjoyed! Who doesn’t love a little spicy kick and some garlic? All you need are these two spices to give this breakfast bowl the authentic flare it needs! You could swap in regular rice here for the quinoa, but I love the fluffiness of quinoa here and the way it mixes in with all the other ingredients. 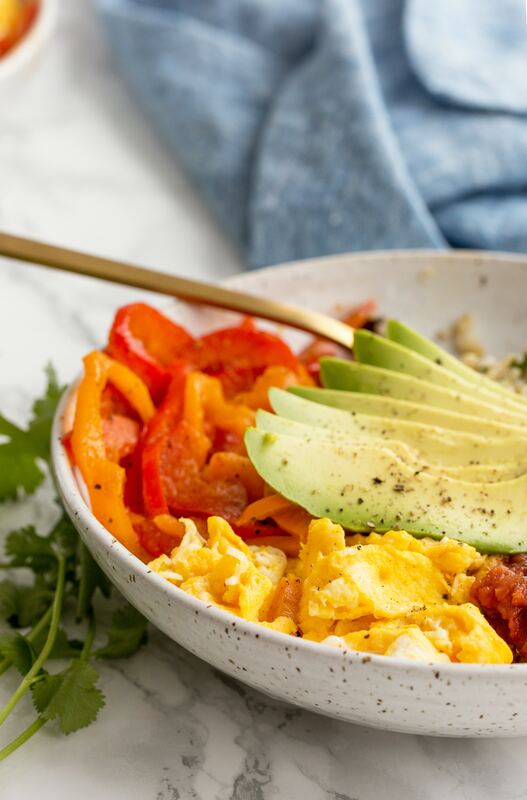 It’s also a complete protein, making this vegetarian breakfast bowl protein-packed! If you want a spin on this breakfast bowl, try serving this with some warm corn tortillas and serving the eggs fried instead of scrambled. Note: Although this post is sponsored by Simply Organic, all of these opinions are my own. 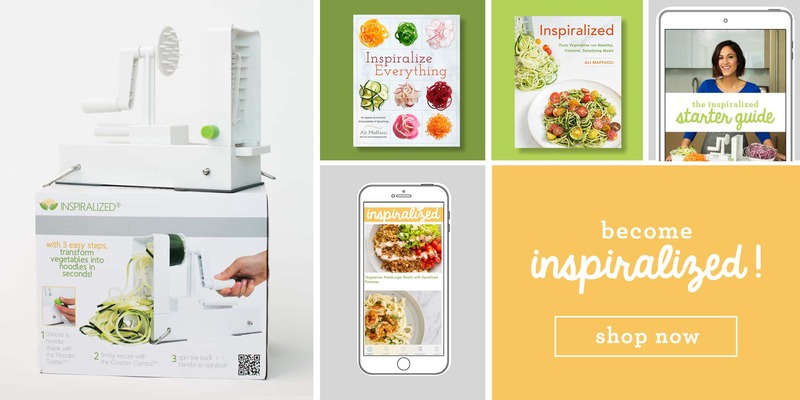 Thanks to Simply Organic for supporting Inspiralized! In a medium mixing bowl, toss together the quinoa, lime, cilantro, and black beans. Divide into two dinner bowls. Heat the oil in a large skillet over medium-high heat. Once oil is shimmering, add the bell pepper noodles and season with garlic powder, chili powder, salt, and pepper. Toss well to coat and let cook for 5 minutes or until crisp tender. Divide into the two bowls with the quinoa and set aside. Add the eggs to the pan and stir until scrambled. Divide onto the bowls with the peppers. Top the bowls with avocado and salsa. Yum! Can't wait for this weekend to try this one! Yes! Let us know how they turn out! What happened to the Moroccan and carrot salad recipe posted on 4/16? It says it's four servings, but in the recipe it says to divide between two bowls.